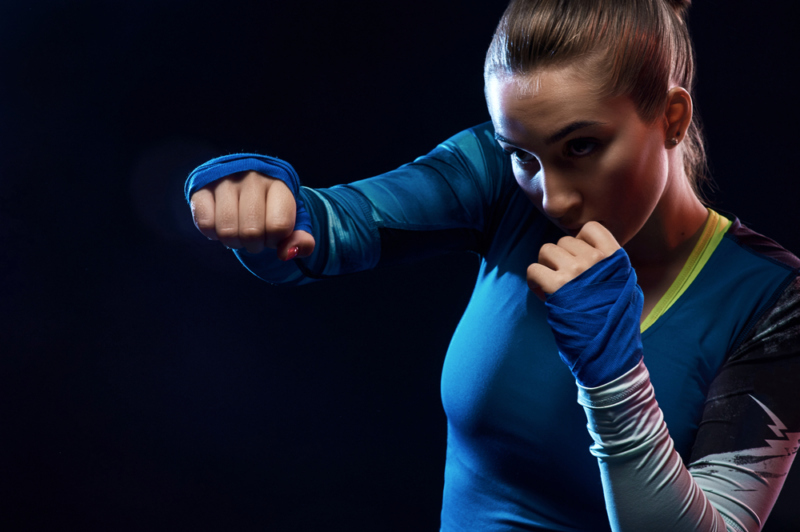 Some people consider martial arts too violent for women, but Muay Thai has proven that mixed martial arts are just as exciting and beneficial to women as men. Thanks to its many health and fitness benefits, this wonderful sport hailing from Thailand has been adopted by women from around the world. Muay Thai or Thai boxing, as it is also known, is a martial art based on discipline, which makes it an alternative to traditional boxing and is an excellent tool for weight loss, strengthening the body and elevating the mind. If you are looking for an entertaining sport that will help you balance your body and mind, this is the perfect option. Considered by many to be the cream of the crop of all MMAs, Muay Thai is based on a system of techniques and strikes that focus on the legs, knees, arms and elbows. Thanks to this particular predilection for using the lower extremities Muay Thai tones the legs rapidly. In the case of women, it is ideal to eliminate cellulite behind the thighs. All the effort put into kicking will tone, develop, and lengthen the quadriceps muscles in each leg. Also targeted by the training will be the buttocks, which tighten significantly by the exercise performed by the entire muscle and body in general. When it comes to the waist, it is highly indicated for all those women who consider their abdomen highly problematic. The exercises required to perform Muay Thai work the waist and abdominal muscles thoroughly, resulting in dramatic weight loss reduction of fat around the waist. Thai boxing requires the whole body to be carried out and, although the arms and legs are used, in the whole process the hips and waist are involved and due to the type of movements and athletic rotations required for certain combinations incredible benefits are received. For example, the spine will be protected immensely due to improvements to flexibility in the hip. If you have a pre-established condition affecting your back extra care should be taken, but overall, Muay Thai training can provide great pain relief. The most efficient way to become a Muay Thai expert is to search for and join one of Thailand’s training camp programs. This type of fitness program is designed from the ground up to the most comprehensive method for learning the best martial arts in the world. Women will be particularly served by joining since the training camps offer all inclusive packages. Thailand is a lovely place that can offer limitless enjoyment and memorable adventures; there is no better place to learn. Muay Thai training camps such as www.chalongmuaythai.com will make sure you never find yourself at a loss when it comes to becoming the better version of yourself that you want to be. If you have ever dreamed of having a beautiful and fit body in addition to good health, then get a move and start training Muay Thai!